If you are looking for a simpler way to learn Mandarin, then the Wen-Hu iOS app is probably the chance you are going to get to accomplish that successfully. The motive behind this app is to provide Mandarin learners the best possible app that will enable even a dummie know Mandarin in the shortest possible time. With the app, Mandarin words are broken into the simplest possible radicals through the use of an impeccable word-reveal system. The revealed radicals and components are listed in the app sequentially until you find the multi-choice translation that you are looking for. In order to make identification and learning of relevant Mandarin characters interesting, the Wen-Hu is fortified with several features that will challenge you and also make learning Mandarin fun and engaging. 1. Time trial mode: This mode allows you to pick as many correct translations as possible in the short period of time given. Bonus time is awarded for correct answers while a time reduction is the penalty for any wrong answer that you choose. This is aimed at helping you improve Mandarin fluency and also your global ranking. 2. Word Challenge: This mode is more challenging. You are required to select and utilize the number of correct words that can be played in a row. A wrong answer ends the game with no warnings or bonuses. 3. Practice Mode: If you are not up for challenges, you can improve your game play and learning speed at your own pace using the Practice mode. - Phonetic Components that gives you an idea of what the pronunciation of the Mandarin character would be. - Radicals which will help you get the meaning of a word. - Topics and sets of commonly used words. Free word packs are also available, be on the look out for them so that you can some freebies the app has for you. 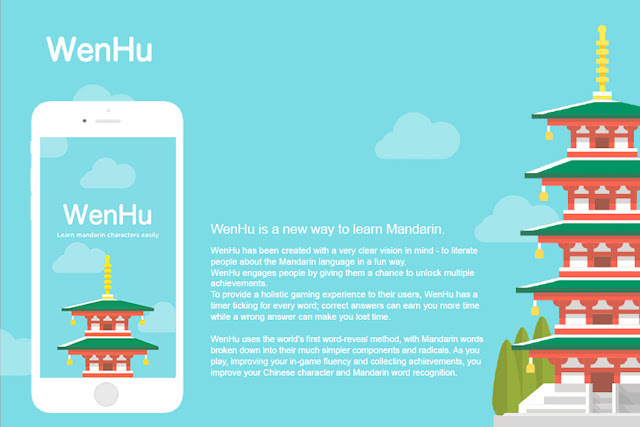 The Wen-Hu app ensures that as you play the game, your Mandarin fluency improves and so does your recognition of Chinese characters. Your fluency level and ratings are displayed in statistics which also includes your overall success level. Wen-Hu app downloaded from the Apple app store contains in-app purchases for additional word packs.